It’s easy to forget about Thanksgiving in Paris. There are no bags of stuffing mix clogging the aisles in the supermarkets. If you asked a clerk where is the canned pumpkin, they would look at you like you were fou (crazy). And if you open the newspaper, you won’t come across any sales on whole turkeys. In fact, it’s quite the opposite; a friend saw a 5 kilo turkey, an 11 pound bird, at the market the other day for €68kg, or €340 ($424). I suggested that the turkey vendor perhaps forgot a comma because whole turkeys are, indeed, available in Paris, and they actually excellent since most are fermier, not the plump whoppers you see in the states. The only thing you have to be careful about is that one turkey might not be enough if you’re feeding a large crowd, say, a group of over six people. Savvy Americans know to order a whole turkey in advance from their butcher and – get this: You can ask them to cook it for you. Yes, since the butchers usually have spits with roasting chickens on them, it’s usually not a problem for them to slide a turkey on there. That’s especially nice because most people in Paris just have one oven and it’s hard to tie it up for the entire day with just a bird roasting in it when you’ve got so many other things to bake and cook off. The reason I am sharing this recipe today, rather than days ago when everyone was in a tizzy posting recipes, shopping and preparing their menus, is that I kind of forgot that it’s Thanksgiving. Actually, I didn’t quite forget, but wasn’t swept up in the frenzy because this week, and today, are just like any other week or day in Paris. So we’re celebrating tomorrow night with some friends who are making dinner. I’m pitching in and doing some baking, as well as bringing a nice bottle of Sauternes. I also happened to have a few cans of cranberry sauce that I had brought back from the states, that I was planning to bring, just for fun. I sent my hostess a photo and she wrote back right away, threatening to blackmail me by making my canned contraband photo public. I beat her to the punch, posting it on Instagram. But when I noticed that of the four ingredients in the can, two were industrial sweeteners, I decided to take matters into my own hands. Fortunately I had a stash of fresh cranberries in my freezer, since if a turkey was €68 a pound, I’d have to dig deeper into my pockets if I was going to have to buy fresh cranberries in Paris on Thanksgiving Day. I candied some organic orange slices (which were normally priced), simmered up a syrup with the sharpness of cider vinegar and a hit of dark rum, then added my precious canneberges, cooking them ’til they popped. I stirred in the candied oranges, then packed it up, ready to go – getting a recipe in just under the wire. Note that the orange slices may fall apart as they get close to being done. Not to worry; they’re just going to be chopped up later. If you want, you can substitute 3/4 cup (180ml) orange juice for the water that you cook the cranberries in. I use dark rum, but whiskey, bourbon, or an orange-flavored liqueur, such as Grand Marnier or Cointreau, would work nicely in its place. You can double or triple the recipe if you wish. 1. Lop off the two ends of the orange. 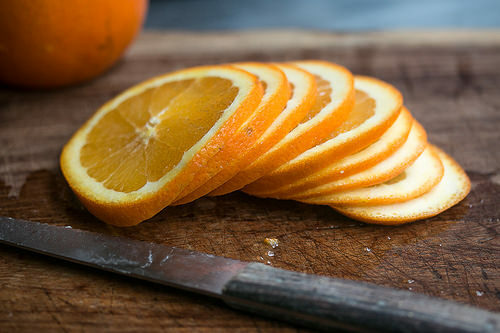 With a sharp, serrated knife, cut the orange into 1/3-inch (1cm) slices. 2. 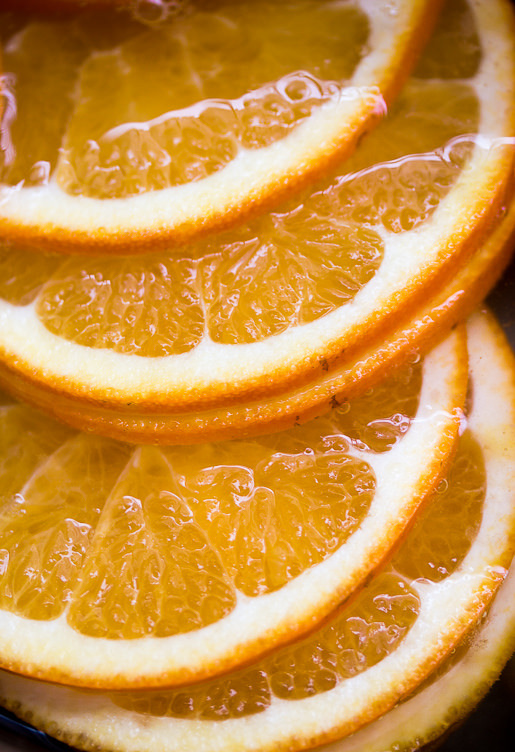 In a medium-sized nonreactive saucepan, cover the orange slices with cold water. Bring to a boil, reduce heat, and cook at a low boil for 10 minutes. Drain. Return the oranges to the saucepan. Cover with water again, bring to a boil, and cook for another 10 minutes. Drain and rinse with cold water. 3. Return the orange slices to the saucepan, add 3/4 cup of water and granulated sugar. Bring to a boil then reduce the heat to a low boil and cook until the liquid is reduced to a thick syrup. 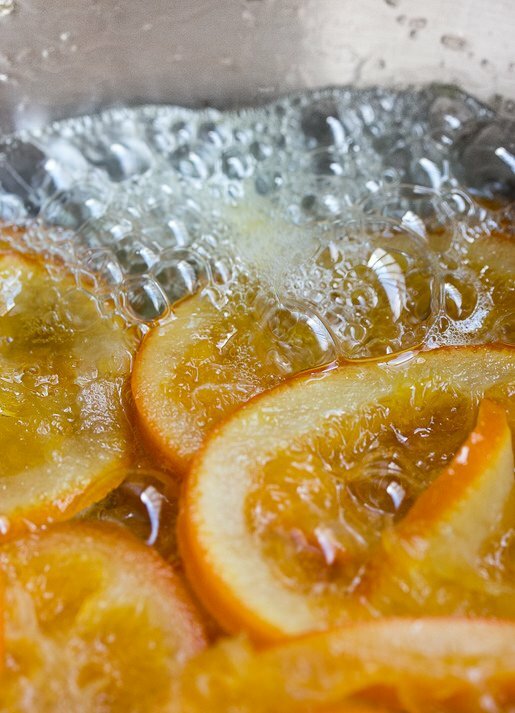 During cooking, turn the oranges a few times in the reducing syrup so that they candy evenly. 4. As the liquid cooks down, close to when there is very little in the saucepan, monitor them closely turning them frequently to avoid burning them. Remove from heat once most of the liquid is evaporated. Tilt the oranges into a colander and let cool. 5. In the same saucepan, add the other 3/4 cup water, brown sugar, rum, cinnamon stick, vinegar, and allspice. Bring to a boil, add the cranberries, then reduce the heat slightly and cook until the cranberries pop and just start to fall apart. Chop the candied oranges into little pieces about the size of peas and add the candied oranges to the cranberries. Cook for about a minute, then remove from heat. 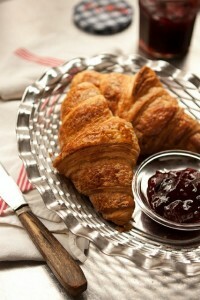 Serving: Pluck out the cinnamon stick and serve the sauce warm or at room temperature. Storage: The sauce can be made up to one week in advance and refrigerated. Bring to room temperature before serving. This sounds so good! 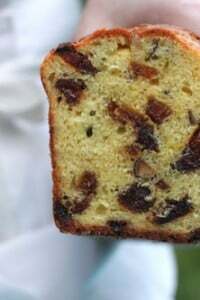 I love cranberry and orange together–my contribution to today’s feast is a cranberry orange bread with pecans. 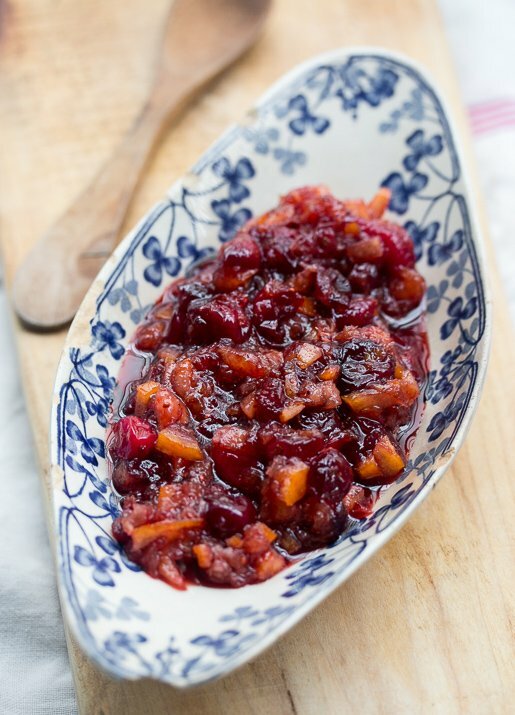 My mom always makes a cranberry orange relish with many of the same ingredients as this recipe, except raw and finely chopped in the food processor. I got a jar of ‘airelles’ from the Swiss mountains from friends yesterday. I first thought of cranberries but immediately realised that they would be ‘lingonberries, lowbush or mountain cranberries’, also read ‘cowberries’ and I confess being confused!…. My ‘airelles’ are red and although cooked still have their berry form slightly intact. :) – couldn’t ask for follow-ups…. This looks great – I think I’ll try it for Christmas dinner! My kid loves that horrible canned jellied cranberry sauce and I’d love to get him to love something a bit more “real.” Thank you for your blog, I love your writing style and the clear “you-ness” that comes through. I’ve found that to be the hardest part on my own blog. If you’re looking to restock your fresh cranberries, try the Galeries Gourmandes at Porte Maillot. I got some last week and the price has actually come down over the past three years…I think it’s due to the “bonne for la santé” message catching on in France. Some of the Monoprix stores have been carrying them as well. Happy Francsgiving, as we call it here! Kiki: Airelles aren’t the same as cranberries. They’re less-tart, although since they’re more easily available in Europe, they can be substituted for cranberries. I’d suggest dialing down the sugar a bit to compensate. And if they’re already cooked, I would just warm them and proceed with the recipe. Happy celebrating! Did you hear America has a glut of Cranberries? So many that the government purchased them to keep prices stable and the farmers in business. Maybe “we” could send some to you? A reward for having such an interesting, educational, entertaining, fun blog! All the Cranberries you want………Happy Thanksgiving David…I am thankful for you and your work. This sounds delicious – being British, I don’t celebrate Thanksgiving unfortunately, but I’ll definitely be using this recipe for Christmas dinner! It sounds like a lovely alternative to cranberry sauce in jars. Happy Thanksgiving to you. I really enjoyed your story. I could just imagine the greedy vendor, charging 70 Euro per kilo of a precious turkey to gullible Americans in the days leading up to Thanksgiving! Glad you found a way around it, and that you’ll still be enjoying a proper Thanksgiving celebration among friends. Fortunately, those kinds of things are fairly rare in Paris. However whole turkeys in France are generally pricey because most are free-range. (You can buy cheap industrially raised turkey parts in the supermarkets, but usually just the legs, in France.) That one priced at €68kg was, truly, breathtaking. And I hope no one bought it! I love your recipe, especially the addition of the rum. I am now the only one who will eat cranberries at Thanksgiving dinner so we don’t make it anymore. I use my grandmother’s hand crank grinder to make them. I grind a cut up orange with a bag of cranberries, add a bunch of sugar (to taste) and refrigerate it. Yummy. Thanks and hope your Thanksgiving Day has been a good one. Last year I saw a spit roasted turkey in Rom but this year I’m in Prague and I didn’t see any turkey. I had duck breast with sweet potato purée and spinach. When I make my cranberry sauce I usually just use orange zest and juice but your recipe looks divine and I have to try it. Thank you and have a wonderful feast. And I thought the €84 I paid (in NL) for my 8 kg fresh turkey was insane–$100 for 17 lbs! Rachel – Please do try to get your son to eat something more “real” but please don’t take away his canned jellied cranberry sauce! I know of a case in which the wife insisted on trying a new cranberry sauce recipe every year and would not allow the husband to have his favorite canned sauce – the marriage did not survive. Perhaps, if your son helped you prepare something new it might change his mind. Someplace this month I saw a recipe for a homemade sauce that was put into an empty can so that it would have the ridges. Good luck! Looks like a nice recipe. Interesting about the Parisian Turkey’s. 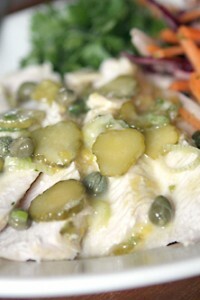 On the news last night was a story about a NYC restaurant Turkey Dinner for $35,000! Being Canadian, our Thanksgiving was a few weeks ago, but maybe for Christmas. I always make a cooked sauce from scratch using fresh berries, but sometimes mold it in a tin can just because (of the retro/ironic presentation). People either giggle or roll their eyes. Whoa! So, until recently the French gov’t only allowed sales but twice a year??? I’d never heard of this. Do you know the reasoning behind this policy? Yes, just twice a year. And there were all sorts of rules for sale items; percentages must be visible (and tags has to show both new and old prices), items could not be brought in especially for a sale, and stores are allowed three markdowns during the two sale periods. Some say it is a measure to protect small businesses, who can’t discount items, from large, big-box retailers, who can afford to sell items at reduced prices, and make up for it in volume. So les soldes (sales) were limited to a period in January and one in the summer. Since the economy is having difficulty, the government relaxed the rules recently to allow sales more often. Not sure if that’s meant to be consumer-friendly, or business-friendly, or both. But you do see sales other times of the year now in France. I’m not actually celebrating, not being American (except that I’m really, really thankful I don’t have to cook and serve a turkey dinner this evening – I was on grandmother duty all day and the boys were very hard work!). But when I do make cranberry sauce, as I do each year if I can get fresh cranberries, I always cook the cranberries in orange juice (like I do rhubarb), with a little added sugar. I find this makes them particularly delicious. The first year we found cranberries in our supermarket, my daughter was a young teenager, so must have been about 20 years ago; the packet had a recipe for a cranberry cake on it, which she decided to make. One of the ingredients, though, was “shortening”, and, as she had absolutely no idea what that was, she left it out, but the resulting cake was still very good. This sounds gorgeous David! I love the orange addition for zestyness! 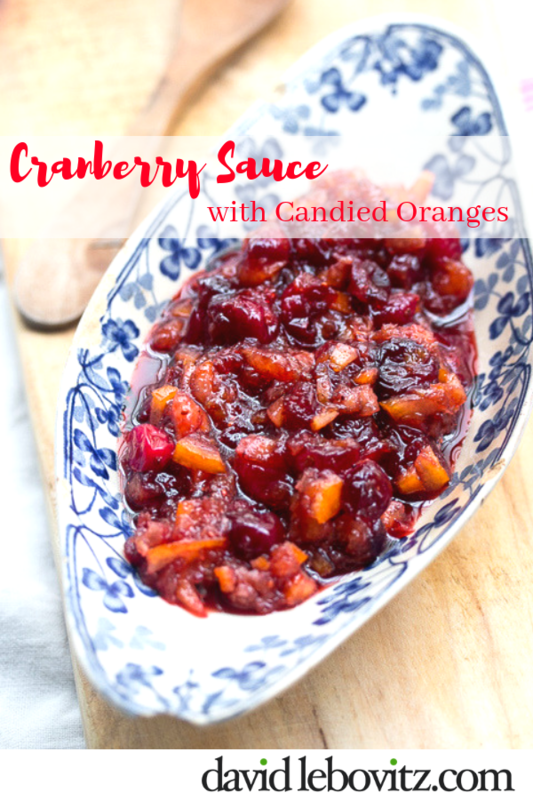 Thanks for the Cranberry Sauce with Candied Oranges recipes I can’t wait to make it, sound really delicious! Love your post! Happy Thanksgiving! lovely!!! 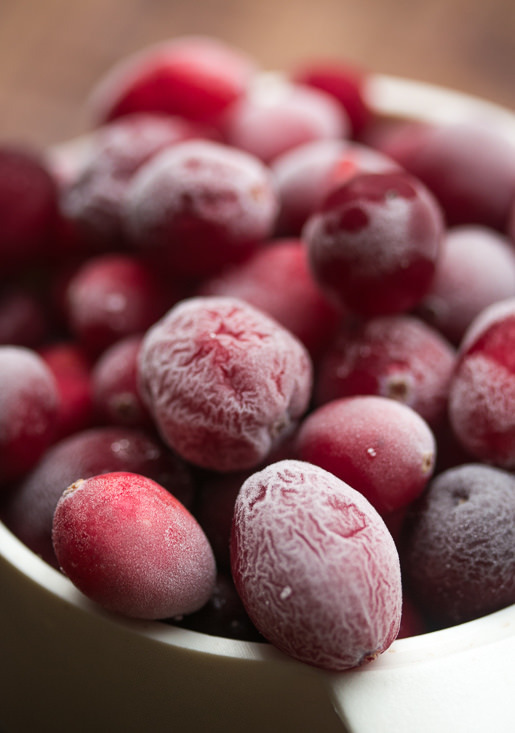 i have my frozen cranberries that a friend smuggled in last month– but another friend shows up tomorrow with a fresh stash- direct from Rhode Island! i am using my orange “mostarda’ to make my sauce– the candied oranges— same idea as yours– but with the italian Mustard essence— as a kick! i love a little heat in everything so will see how it tastes! I just made these, DELICIOUS!!! Thank you so much. I didn’t have rum so used Crispin whisky barrel aged hard cider with a dash of Cointreau.The candied orange slices really add wonderful flavor to the cranberries. For my Thanksgiving in Des Moines, Iowa I made your Cassoulet with your Counterfeit duck confit (I’m from the UK originally). Delicious and easy, made it yesterday and re-heated it today. There were 8 of us and we ate most of it. Two of the eight were a little discomforted by the idea of no turkey but were converted when they tasted the cassoulet. Love your blog and your books, you need to come and visit us in Des Moines, we have a great dining scene. I work part time at a wonderful, locally owned, olive oil, balsamic vinegar, spice etc store, look us up on line at allspiceonline.com. We don’t take ourselves too seriously but have great products. On-line store too y’all. Happy Thanksgiving to all. Next stop Christmas!! dies, it will be reborn as a double oven! I shall never complain of Whole Foods prices, again, after hearing the price of your Thanksgiving turkey! If you give it a try, I recommend cutting the sugar down to 1 cup. I’m an expat living in Taiwan. I just made your cranberry sauce. It was delicious. Thank-you for sharing. When I visited in Paris years back, I spent some time with an ex-pat whose mom had visited around holidays the year before and insisted they have a turkey (for just two of them) for Christmas. He told her he’d already made reservations at a good restaurant. She was horrified and berated him about going out, no home-cooked meal, and repeatedly, the need for a turkey. He gave in, found one, and purchased it. He let his mom know he was coming home from work laden with a turkey. Of course, when he arrived she was horrified. It was a turkey, feathers, head, feet and all. He gave it to his concierge, who received it happily, and off he and his mom went to the restaurant. I’m at home in NJ and I just made the sauce. I think it is quite amazing. Thank you VERY much for sharing. I’ve always previously made my mother’s colld, grind ’em up and toss in some sugar orange and cranberry relish. This is a delicious alternative and it will be served at tomorrow night’s “second Thanksgiving”. I was worried about the sweetness in the candied oranges and the spiciness of the allspice, but they are both perfect. Thank you again! I love reading your blog. I make a new version of cranberry sauce every year and I know in years past I’ve done one with oranges and orange liqueur but never with candied oranges. Which I have to do now. I mean like in tomorrow. I love them and they are a great addition to a simple cocktail; just some sauce and Prosecco and I’m happy! I make a raw cranberry ‘sauce’ too and to get the velvety texture as you mention, I pour a fresh date puree over everything: fresh cranberries whirled in the processor to break them up, an almost equal amount of 1/4″ dice ripe, sweet persimmon, and supremed tangerine segments and pomegrante arils. It’s so good! Yours sounds like it would be the best for a cooked version, never thought to candy the orange and it sounds amazing! What a great looking sauce! My niece does a similar one (but yours looks a bit better). One lady (years ago) called a university in Wisconsin to see if the frozen turkey found in the bottom of her elderly mother’s freezer was still good to eat for Thanksgiving. The date was only 23 years past due. The professor on the phone diplomatically told her not to chance it. The woman then proceeded to say that she would then donate the bird to the local Lutheran food pantry for the poor. I’ve made the version with red wine and figs two years running now – it’s a big hit. I’m going to try this one over the winter – it sounds great. Nice and fresh. I would “kill” for a smaller bird as you described………. Can only get behemoth and -behemoth Turkeys around here……………and I, in my little New York kitchen, only have a small, counter top oven..
Looks great, David. I have had my own favorite recipe for whole berry cranberry sauce for quite a few years now, but this looks like a contender. I’ll try it next time I make cranberry sauce. I generally go for the simplest version of cranberry sauce: cranberries, white sugar, water and a cinnamon stick. But dark rum, brown sugar and candied oranges tempt me to try your recipe. Happy Thanksgiving weekend. Cranberry sauce is one of my favorite parts of Thanksgiving! 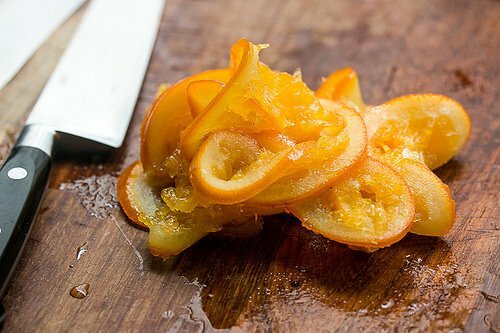 Candied oranges sound like a great addition for it! this is gorgeous & sounds delicious! I’ve made the raw cranberry sauce mentioned above–cranberries and other stuff (in the case of my recipe, horseradish) chopped up fine in the food processor. You’re right that it doesn’t get the velvety, jammy quality of cooked cranberries, but it’s very bright and refreshing and tasty in its own right. I think I got my version from Please To the Table, the Russian cookbook. I fell in love with your stories and recipes.